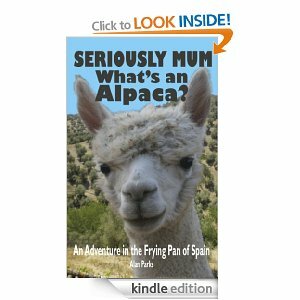 ‘Seriously Mum, What’s an Alpaca?’ is the frank and charming story of a brave couple who risk everything to move to Spain to breed alpacas. Their intention is to make a living, but first they must negotiate their way through the Spanish property market, local characters, rogue builders and the worst weather Andalucía has seen for 100 years. Alan and Lorna experience the joy, but also the heartbreak of alpaca breeding, picking up an assortment of stray animals on the way. ‘Seriously Mum, What’s an Alpaca?’ may be full of glorious highs and monumental lows, but it is essentially a story of endeavour and spirit, living each day as though it may be the last. It is available through Amazon.